Great Bohus post! If you visit my website, you will see that I too have a particular interest in all things Bohus related. I hope you break down and order the Forest Darkness; it's stunning! What's the link to your blog? If you click on my name (Susanna in Seattle) in the comments, that should link you to my site. 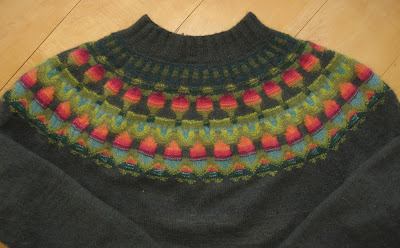 I am always so happy to see people knitting Bohus garments from the Swedish kits since I spent a lot of time translating the instructions into English - makes me feel that it was all worth it! And there are several other designs that are in the process of being re-created by Solveig Gustafsson. Susanna--thank you so much for that link! What beautiful sweaters! I contacted her about the Sago Palm! Wow! Poetry in Stitches is back in print! It was not available for about a year and a half, but it is back at my yarn store now. 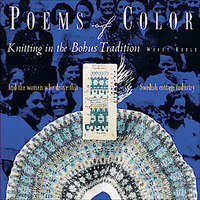 Oops, I meant Poems of Color - I usually just think of it as "that Bohus book." Oh, wow! Those sweaters are stunning. I'd never even heard of Bohus, thank you for introducing me to something this beautiful! Wonderful, I recently found this book in a used book store...and have been dreaming over the sweaters. Also the history of Bohus is so totally fasinating, the book is a super addition to any knitting library. First of all-- absolutely gorgeous sweaters. You've selected the two designs that I've been most attracted to thus far in Wendy Keele's book. I love your blog! 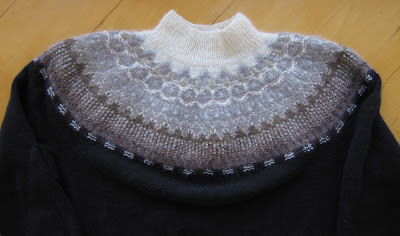 I've been thinking about Bohus for the last 1.5 years-- and I just ordered the Large [Lace] Collar from Solveig in Sweeden!!! I'm very excited. Those are gorgeous sweaters! Your DH is truly lucky!